BET has announced the second season premiere of the It’s a Mann’s World TV show and the series premiere of About the Business, starring model and actress Eva Marcelle. 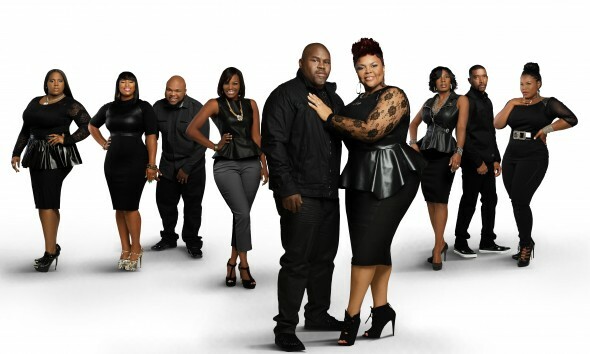 David and Tamela Mann return with It’s a Mann’s World season two, Tuesday, February 23, 2016, at 10:00pm ET/PT. About the Business kicks off Wednesday, February 24, 2016, at 10:00pm ET/PT. NEW YORK, NY – January 28, 2016 – BET Networks announces two new docuseries premieres in February, with the season two return of “IT’S A MANN’S WORLD” starring David and Tamela Mann, and the series premiere of “ABOUT THE BUSINESS” starring actress and model Eva Marcille. The ten-episode season of “IT’S A MANN’S WORLD” continues to follow the hilarious and heartwarming antics of the larger-than-life Mann clan, as they balance their Hollywood careers with family life in Dallas. Back in Los Angeles, the new docuseries “ABOUT THE BUSINESS” will follow the fabulous lives of a tight-knit glamorous group of Hollywood professionals, hustling to make their mark in the entertainment industry. Produced in partnership with Entertainment One (eOne), both series will explore the dramatic peaks and pitfalls of real-life family and friendship dynamics in the high-stakes world of entertainment and beyond. “IT’S A MANN’S WORLD” premieres Tuesday, February 23, 2016 at 10 P.M. ET/PT, and “ABOUT THE BUSINESS” launches Wednesday, February 24, 2016 at 10 P.M. ET/PT on BET Networks. “IT’S A MANN’S WORLD” is a fun, multigenerational family docu-series that follows entertainment power couple, David and Tamela Mann, as they work to balance their high-profile TV, film, and music careers with their lively family life. Each 30-minute episode of the second season explores the Mann clan celebrating family milestones, giving back to causes close to their hearts, expanding their brand, opening their minds to new experiences, and most importantly, keeping their family together with love and laughter like only the Manns can. Produced in partnership with eOne, “IT’S A MANN’S WORLD” is executive produced by David and Tamela Mann, eOne’s Tara Long, John Morayniss and Eric Hoberman, Howie Miller, Kim McKoy, Roger M. Bobb, and Phil Thornton. Eva Marcille’s acting career is on fire with two TV shows on the air including Real Husbands of Hollywood. However, Eva knows that the entertainment business can be fickle, so she is diversifying by investing in a luxury container home business with her mother with the ultimate goal of building a Container Home Community empire! We will watch Eva navigate the challenges of taking on a totally new business venture, and working with family and friends. Crystal Renay is a successful model facing two big milestones: she is newly engaged to singer, Ne-Yo, and pregnant with her long-sought-after first child. With her A-list wedding approaching and a baby on the way, the former video vixen hires friend Sparkle to plan the big event to ease some of the stress. Will Crystal’s lofty demands push her friendship over the edge? Sparkle Holmes owns A List Group LA, a successful events, public relations and talent management company, which caters to stars like Nelly and Chris Brown. Sparkle is managing her model friend, Crystal Williams, and has taken the lead in planning all the festivities surrounding her wedding to hit maker, Ne-Yo. Sparkle recently brought in a new business partner, Krista Kolley, but their working styles soon clash. Can the new partners deliver flawless events without imploding? Personally, Sparkle recently ended a 12-year romantic relationship with a woman, and is now struggling to find her identity – as she finds herself attracted to men. EJ King is a celebrity stylist wrapping up a world tour with Chris Brown, and is looking to branch out in the world of fashion. We will follow EJ as he works to capitalize on the success of the tour, and design his own fashion line for Cross Colours. Does EJ have what it takes to transition from stylist to fashion mogul? EJ is also on the hunt for love, but despite recently losing 60 pounds, EJ still struggles with his self-esteem. He soon considers taking drastic steps to alter his appearance, but will those changes lead to love and happiness? Danielle Crawley heads up marketing for Nick Cannon’s Ncredible Entertainment, but she is spreading her wings by launching her own casting company. We will watch as Danielle proves that she has an eye for talent and running her own business. Danielle will also be forced to make tough choices when former-client and rising vocal talent, Alex Amore, signs with close friends Sparkle and Krista. Will business get territorial and dirty among the friends? The series will also feature, Sparkle’s business partner and Eva’s project manager, Krista Kolley, as well as host, model and recording artist, Candice Brooks. Also in partnership with eOne, “ABOUT THE BUSINESS” is executive produced by eOne’s Tara Long, Mark Herwick, and Eric Hoberman, Shanta Conic, and Rob Cornick. BET Networks, a subsidiary of Viacom Inc. (NASDAQ: VIA, VIAB), is the nation’s leading provider of quality entertainment, music, news and public affairs television programming for the African-American audience. The primary BET channel reaches more than 90 million households and can be seen in the United States, Canada, the Caribbean, the United Kingdom and sub-Saharan Africa. BET is the dominant African-American consumer brand with a diverse group of business extensions: BET.com, a leading Internet destination for Black entertainment, music, culture, and news; Centric, the first network dedicated to Black women; BET Digital Networks – BET Gospel and BET Hip Hop, attractive alternatives for cutting-edge entertainment tastes; BET Home Entertainment, a collection of BET-branded offerings for the home environment including DVDs and video-on-demand; BET Event Productions, a full-scale event management and production company with festivals and live events spanning the globe; BET Mobile, which provides ringtones, games and video content for wireless devices; and BET International, which operates BET in the United Kingdom and oversees the extension of BET network programming for global distribution. What do you think? Are you a fan of It’s a Mann’s World? Will you be tuning in for the second season? Do you plan to check out the About the Business TV show, when it premieres on BET? More about: About the Business, About the Business: canceled or renewed?, BET TV shows: canceled or renewed?, It's a Mann's World, It's a Mann's World: canceled or renewed?